This weekend is dance recital weekend in the Vinson house. Grammie and Poppa are coming from out of town. We went to rehearsal last night and received a ton of instructions for the next few days. As a result, it seems as if I have at least two tons of things to remember and think through. Afraid that I will forget something, I have made a list . . . To be honest, I may have gone a little overboard . . . I have actually made about 5 lists this week . . .
Well, I have my weekly "To-Do" list that I make every week containing the tasks and projects I hope to have completed by Sunday evening before I make the next week's list. This list includes laundry, ironing, cleaning, errands and such. Then I have both a Kroger's list AND a Wal-Mart list since I am trying to save a little money here and there (literally!). And I was wondering this morning if I shouldn't try to have a Sam's Club list since I have found that is the best place to buy the baby's formula. I also have a list of things I need to do before the first recital performance this evening, which includes a sub-list of things I need to make sure that I remember to pack. For example, I wrote that I needed to charge the camera batteries, but I also wrote down that I needed to remember to PACK the cameras. I mean what good will it be to have the batteries charged and in the cameras if we leave the cameras at home? Is your mind swimming yet? Sometimes, I think in our efforts to simplify and organize our lives, we just make them more complicated. Amen? This morning I had a special gift from my God, a great, simple, uncomplicated 30 minutes with Him. I made the coffee and sat still. He kept my girls asleep and just reminded me of what I really needed to remember- He is God. Thank you Lord, for gently putting things in perspective this morning. I needed that. And I trust Him to help me prioritize all those things I "must" remember today. If I keep my focus upon Him, my lists won't run my day. He will. Let me encourage you to be still and know that He IS God. God Still Talks . . .
You know that saying, "Be careful what you pray for, you just might get it"? It is SO true! I had been praying about my summer activities and what I really needed to be involved in. I even blogged about it last time, wondering where and how I should focus my energies now that the baby had arrived. With the approach of summer and the prospect of our routine changing with my older daughter out of school, my prayers intensified and I even recruited a couple of good girlfriends to begin praying as well. Sure enough, God answered. In the days leading up to Riley's last day of school my quiet time scriptures all seemed to reflect back to "teaching the next generation" and an intentionality to "pass on the things the Lord had done." So, I assumed that the Lord was just telling me I needed to be more proactive here at home as I went about my daily responsibilities to point my family to Him. BUT, God wasn't done yet! Last Wednesday after dropping off Riley for her last evening ever in Mission Friends and Preschool choir, I went into the preschool resource room and began using my time to begin to prepare for VBS in a few weeks. The next thing I knew I was being recruited to teach Riley's Team Kid Class for the next ten weeks. I told them I would pray about it and get back with them on Sunday . . . . It hit me the next morning in my quiet time, that I had already prayed about it, I just wasn't looking for the answer. Through prayer and scripture, God had already provided me with the direction I had been looking for. Yet for some reason -my own sinful, and self-centered, old nature- when the opportunity to act came, I didn't see it. I didn't have to wait until Sunday to let them know. I knew first thing Thursday morning. So . . . last night I received the biggest blessing and had the most fun teaching six, just-finished, kindergartners all about how they were God's most special creation. It wasn't a "have-to" but truly a "get-to" ministry opportunity . . . and an answered prayer. God made His will for me known. I almost missed it, but He was definitely talking to my heart. I truly know with all of my heart that God does still talk to the hearts of His followers. What has He been telling you lately? Still Remember . . . I hope all of you took some time to remember our fallen soldiers this Memorial Day. Living near Ft. Campbell, our community seems to be more sensitive than many for the sacrifices that our soldiers make. I have many army wives for friends and am amazed at their continued attitude of hope in the Lord. They would proudly say that it is through His strength alone that they survive long deployments and months upon months of uncertainties -even when their husband is considered "home"! Once, I even had one of these precious ladies, a pastor's daughter herself, remark that she thought she had it easier as an army wife and mother than I did as a minister's wife! Patricia has managed two small preschool boys, a home and ministry opportunities all by herself through two of her husband's deployments. She has such an amazing inner strength and devoted character, it is obvious to anyone and everyone that it comes from the Lord. She never complains and always is focused upon the needs of others. 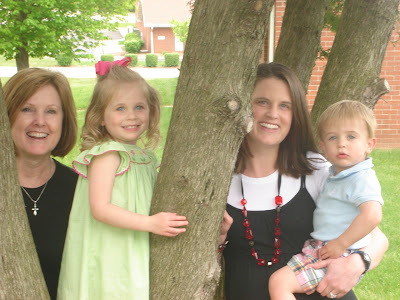 God is continually glorified through Patricia and many other military families like hers. Unfortunately, I know a few other military wives that aren't so Godly. They are representative of the majority of military families where God is non-existent in the house or hearts of these soldiers and their wives. Upon the return on the 101st Airborne Division, Clarksville has seen a rise in domestic violence, suicide and divorce. I know that God can, will and is using even these sad situations for His glory even if it s far from obvious as to how. So even though the Memorial Day holiday has passed for 2009, please keep remembering those that have made the ultimate sacrifice for our country as well as those that are still sacrificing. Our military is an incredible opportunity for God's glory and work to be done. The federal government is paying for many of our troops to go and be missionaries in parts of the world where our International Mission Board is forbidden to send our own missionaries. As you pray, pray for these families, the soldiers and all those affected by their missions . . . They are God appointed ones, even if they are not necessarily those ordered by those who out-rank them in command. For we are all soldiers in the Lord's army . . .
Today we had the opportunity to sit with our daughter while our son-in-law graduated from Southeastern Seminary. There was such an air of excitement in that chapel. Before they handed out the diplomas they asked all the spouses of the graduates to stand. The President of the Seminary spoke of the sacrifices these people made. As I looked at the faces of mostly young ladies, there was such pride in the accomplishments made by their husbands. I didn't see any signs of bitterness because of what they went through to allow these men to graduate. Instead, all you could see was glowing smiles, knowing that together they had done what the Lord had led them to do. I remember back when Randy was in Seminary. He would have to commute 5 hours every day to get to school, and then come home and pastor a church. It was a really hard time but we got through it. What about you? Do you remember when your husband was in school? Seminary years were difficult at best. If you lived on campus, the housing was usually not the best in the world. There was no extra money -- at all!!! There was little time to go do anything with him (not that you had money to spend anyway) and when he was home, he was usually studying, which meant he couldn't help alot with the children or with chores. But you know, there were some good times. Some of the friends we met while in seminary are still some of our best friends. And we definitely made some memories. What are some things that you remember from your seminary days? I would love for you to share them with me. I would like to give them to my daughter in a booklet as a rememberance. So, if you don't mind, take a few seconds and reply to this and let me hear from you. I think it would be hysterical to hear some of your experiences. I can't believe it, but our granddaughter turned 2 today. Happy Birthday Maddie! I wanted to see her today, but didn't know how I could. She lives in Murfreesboro, which is about 3 1/2 hours to the West of Sevierville, but our son-in-law Kevin is graduating in the morning from Southeastern Seminary in Wake Forest, NC which is about 6 1/2 hours East of Sevierville. So we decided that we would not be able to see Maddie today. But the more I thought about the events of that day, the more I wanted to see her. On the Monday morning she was born, our daughter Beth was induced at 6:00 a.m. The dr. came by to check on her about 7:30 and told her that she would probably deliver around 4:00 that afternoon. But God definitely had other plans. About 8:30 the anesthesiologist came in for what we thought was a regular epidural. Because of some health issues, they decided it would be better if they did not give it to her and told her that she would have to deliver naturally. Beth informed the nurse that she had not even paid attention to that part of the birthing class because she had every intention of having an epidural. The nurse was so sweet and told her she would be fine and that she could get through this. Beth had been in some pretty intense pain already and was quite concerned how she would handle anything worse. The nurse checked her with the intention of planning out the labor when, much to everyone's surprise, she was already completely dialated. She started barking orders and setting everything into motion before we realized what was going on. She finally told us that Beth would be delivering within the hour. Things started happening so quickly we could hardly keep up. The dr. barely made it - literally. He ran in the door just in time to catch Maddie!! What took place though in those few minutes was unbelievable. Beth had asked me to be in the delivery room and I was thrilled. As I stepped back and watched this beautiful process I saw the Lord perform a miracle right before my eyes. As they placed that little baby into Beth's arms she began talking to her like she had been doing that all her life. I literally saw my baby be transformed into a mother right before my eyes. I will never forget it. So as I relived that day, I decided to make the effort to go to Murfreesboro. So last night after church we drove to Murfreesboro so we could have breakfast with Maddie this morning. We would have to leave by 9:00 their time to make to our other daughter's by supper. Beth and Derrick kept laughing at us, telling us they could not believe we had driven all that way just to have breakfast. I was beginning to think it was a crazy idea too...until Maddie came running up to me. As I picked her up, she threw her little arms around my neck and hugged me so tight that she grunted. Then she looked me square in the eyes and then kissed me. My heart melted. I knew then that going the second mile (or the hundredth mile) was worth it all! We have now arrived in Wake Forest. We went by Wendy and Kevin's to visit a little while and are looking forward to graduation tomorrow and all of the festivities. For right now though, I have to admit, that I am just happy to be in a bed, instead of a car!!!! Ok, so maybe not the saddle, but I did go for my first bike ride again since I broke my back last August. It hasn't been because I was afraid, I truly haven't had time. But yesterday after working in the yard Randy and I decided we would try it again. We rode down a new stretch of highway that has only been opened a year or so. There are no billboards and not a lot of traffic. The mountains were straight in front of us. The air was cool and you could smell the honeysuckle along the banks of the creek. It was so nice. I was thrilled when we made it back without incident!! As silly as it sounds, I was glad that it was just an ordinary ride. It proved to me that what happened before was just an accident, not that I was unable to do what children do all the time!!! As I rode along I thought about how our Christian lives are like that bike accident., Sometimes we fall and God, in all His infinite wisdom and kindness, picks us up, brushes off and sends us back down our path. I am awfully glad that He is a God of second chances!!! Well, after a week of being gone (again) I am home. This has been such a crazy spring and there has been a lot going on. But to be honest, I think most of my springs the last several years have been hectic. Three years ago this time we were planning our oldest daughter's wedding. Then two years ago tomorrow, our first granddaughter was born. Last year, my mom passed away. This year there have been a lot of out of town trips that I have had to make. Anyway, I am home for now. For the first time this year, I am out on my porch, my legs crossed with computer in my lap, swinging. It is so peaceful. The roses in my garden are in full bloom, the birds are in the birdhouse fluttering in and out singing up a storm, our grass (which looked like hay until I mowed it yesterday) is cut and the sun is shining. All that, in and of itself, is enough to praise the Lord for. I feel like sometimes I fly through life without really slowing down to enjoy what the Lord has blessed me with. I received a call today from a young mom. I think she just needed someone to talk to. After discussing what she originally called about, she began to tell me that her husband was out of town on business and she was home alone with her two preschool daughters, one that is 3 and the other 1 1/2. The youngest was sick with a fever and an upper respiratory infection and the mom said that she would cry for a few minutes, then be happy, then cry again. The 3 year old sounds like the typical 3 year old...talking non-stop. The sweet young mom sounded tired and little exasperated. I thought back to when my girls were that age and could remember exactly how she felt. The difference is that now I realize that those times pass so quickly, and there are days I would do anything to be home with them again. My point is that life doesn't slow down for any of us. Sometimes I need to just make myself enjoy the moment. Right now I could be doing a 100 different things but I am going to choose to sit here in the quietness of the moment and thank God for the blessings of today. OK, GOD REALLY DOES HAVE A SENSE OF HUMOR!!! As I was about to sign off there was a fire truck and ambulance that came whizzing by. The sirens were so loud that it hurt my ears. Then a woodpecker started pecking like crazy on a tree right across the street. My phone rang and someone has begun cutting their grass with a very loud mower!!!! I am just glad I enjoyed the "moments" while I had them. We are in southern California visiting my dad right now....and Ernie and I have just returned home from church. There is a Bible teaching Body of believers close by that has been an oasis to me each time I visit here. They especially ministered to me during my mother's illness and death as I desperately needed to be around believers. They had no idea they ministered to me....because I spoke to no one, but minister they did!! Today, as we were worshipping, I became overwhelmed with love for my God...for His provisions and His love and His desire to bring restoration to those of us who desperately need to be restored. I was overcome with emotion because not only was I worshipping my amazing God with my husband actually sitting next to me, but I was experiencing a miracle. One year ago my little brother (well, he is not so little at 44!!) attempted suicide--twice--and was far away from God. His life was a mess and he knew it. He hit bottom and bottom was hard and painful and dark. Today he sat next to me and worshipped. He is being restored. He is no longer at the bottom....he is being recued. As I sat there, I kept thinking and praying for you all who have children like my brother. They are far from God and your heart is breaking. I shared with you earlier this week how you moms who are battling satan for the very lives of your children are heavy on my heart and I knew I had to encourage you once again this week. God is continually at work behind the scenes. We must trust Him. I never would have thought I would see my baby brother seeking God and I confess my faith is weak....BUT be encouraged, my friend, God is in the restoration process. Watch Him work!!! We sang softly "It Is Well With My Soul" ....and I wept again. There were many times I could not sing those words because nothing was well with my soul....but today....as I worshipped before the throne of my God and heard the voice of my brother and reflected on how He has restored us both....I could say without hesitation....IT IS WELL WITH MY SOUL!! Ernie and I “inherited” a beautiful, old, heirloom framed cross-stitch picture of the Lord’s prayer that for as long as I can remember hung in my grandparents’ home. We do not know how old it is or who created it…all we know is that my mother remembers it hanging in her grandparent’s home. I wish I could show it to you! Someone put a lot of time and love and creative juices into this beautiful piece of art. To me, however, it is more than art. It is more than cross stitch. It is a symbol of God’s faithfulness. I do not know of any followers of Christ in my ancestry but I believe that there was a woman in my genealogy who walked with the Lord. Who knew Him…not just knew about Him. I can see her sitting beside a flickering candle sewing long after the chores were done and the children were in bed. Not only is she sewing, but I can see her lips moving in prayer. Praying for her husband. Praying for her children…for the one who is running hard after the world. Praying for the one whose heart has hardened towards the things of God and has chosen a path that breaks her heart and the heart of God. Many of you have children who are following hard after Christ. They are lovers of God and lovers of His Word and you are blessed indeed. Many of you, on the other hand, have children who are wandering in the wilderness, who have been swept up in all of the glamour and fun the world has to offer and your heart breaks. I have cried with many of you, prayed for you and know your stories. I am not sure how to express this….but I know that the Mother’s Day “season” can be difficult for lots of women for lots of reasons. Infertility. Loss of child. Loss of mom. Difficult relationship with child/mother. The list could go on and on and I wish I had an easy, quick fix for you, but I do know the One who provides all comfort, strength, power and joy in the midst of pain. The One who is Faithful. If we are not careful, we can get our focus so much on today….on our children and our grandchildren….our situations and our pain that we neglect to think about, pray for, invest in “the next generation…even the children not yet born.” Oh, ladies….just think, we can have an impact on little girls and boys generations from now!! Pray for the “children not yet born”! Perhaps that is why you are walking with the Lord right now! Someone decades ago prayed for you….just as I believe someone did for me! Father, comfort my sister who is burdened for her child. Fill her with your peace, your power and your wisdom. Move in that child’s heart….bring them to You. May we have an impact on generations yet to come....In Jesus’ name. Amen. Mother’s Day was Sunday and it was the first time in many years that I was able to celebrate it with any of my children or grandchildren. Since our daughter moved here last month, we had such fun hanging out (literally in this tree!!) with her and her family! Our son called and made the day so very special. I spent a lot of time this week thinking about what I taught my children and what my mom taught me. · How to sew. I had to be sure that the inside looked as good as the outside!! I still have some formals she made for me that I wore in the 70’s and I cherish them!! They look ridiculous by today’s standards, but have been really big hits when the high school would have 70’s day!! · To cook. My three brothers and I were often responsible for taking turns and cooking a meal for our entire family. None of us will ever forget the time I made meatloaf and put in 2 CUPS of salt!! · To iron. She taught me to wash and dry the clothes…then “sprinkle” them with water, roll them up really, really tight and put them in a plastic bag so they could get wet again and ready to iron!! How crazy was that??? · Not to call boys!! I was shocked when our son would get a zillion phone calls from girls…at all hours of the night at that!! It was so instilled in me that it seemed like it took forever before I could call my husband without worrying that I would “get in trouble” with my mom!! · To make sure the boy would come to the door to get me and not to run out to a waiting car! · To write thank you notes. · Manners! She would bang on any elbow that was on the table!! These are just a few of the zillion things she taught me. Intentionally. They were skills and attitudes and actions that were important to her; that she could do well and wanted to be sure that I did them well. Intentional teaching. What are some of the things your mom taught you? Unfortunately, like all of us, she also taught me many things unintentionally. First, I must tell you that my mom was a very well-liked, friendly woman with lots of incredible traits and it is difficult to share some of this because I do so desperately want to honor her…but she did not know my Jesus and I learned how to be critical, how to stretch the truth, manipulate and to talk about other people as I observed and listened growing up. You know, she never sat me down and said, “Honey, this is how you can stretch the truth…” No. It was unintentional. But taught it was. And I learned it well! I have spent the years since becoming a Christ follower being transformed by the renewing of my mind through the grace and mercy of my God and moving farther and farther away from being the critical, manipulative woman I once was. Praise God! Whether we like it or not, we are teaching. Some of what we teach is purposeful and intentional. Much of our teaching is unintentional….but can be “learned” just as easily. Every critical word we say or complaint we make or rolling of the eyes can be picked up by those who are watching and learning and modeling. Even the simplest way we phrase things like, “We get to go to church” rather than “We have to go to church” can make an impact on the lives around us. Oh, Father, may we be intentional teachers of the Truth and may our lives reflect Your Son…may our unintentional teaching be of You. In Jesus’ name….amen. My electricity just came back on and I thought I better get this going before the next storm hits. The weather this time of year is unpredictable and reminds me of my life. I know each of you has experienced your share of storms. In ministry it seems they come in waves. Yet, just as God is in control of the creation, He is also in control of the storms that come into our lives. I have much to do today. My mother is coming for the weekend, there is grocery shopping and laundry to be done, beds to be changed. After spending some time in God's word, my feet hit the ground running. Then...the lights went out - everything stopped - washing machine, dish washer, even my garage door would not work, there was nothing I could do. As I sat in the dark den this morning watching the trees dance and the rain come down, I was in awe at the power of our God. The thunder was deafening, the lightning ferocious and the wind so strong that the largest trees in the yard were bending as though they were toothpicks. I sat and began to praise my God for His power and majesty. We fellowshiped, loved each other and talked. What a sweet time in the middle of a storm. Well, the lights are back and my feet are on the ground again, but I am so grateful for the time God demanded of me this morning by stopping me in my tracks. Take some time today to talk to Him about the storms you are in or facing. He already knows, but loves to have time with you. I know you are familiar with the verse in Hebrews 4:12 "For the word of God is living and powerful, and sharper than any two-edged sword, piercing even to the division of soul and spirit, and of joints and marrow, and is a discerner of the thoughts and intents of the heart." Because of my cancers I have a new understanding for the emphasis of joints and marrow. One of the continual tests I must have is a bone marrow test. It is one I always dread. I am asked lay on my stomach on a hard metal table. They begin to clean and sterilize the upper portion on my hip. I am asked to lay very still as they begin the process of numbing the area. After they consider it numb, they begin the test. Using a large, long needle they begin to go into my hip. Unlike the needle they use to numb which is basically the skin area, they continue to press into my hip until they get to bone, then they continue into the bone until they get to the marrow. At that point they begin to withdraw some marrow. When the marrow is withdrawn they go back in and actually get a small portion of bone! Yes, it hurts! In fact, because of the many times I have had the test and the build up of scar tissue, they have been putting me to sleep - Thank you, Lord for that mercy. When God tells us His word pierces the joint and marrow, He is letting us know that He wants to get to the center of our life. He wants to produce a life in us that is righteous, pure, holy and in order to do that He must get to the marrow of our spiritual life. He wants to check our sin cells and cure them. We must allow God's word to pierce even though it is painful. If our churches are going to see revival, a new love for Christ explode, a heart for the lost, we must allow God to pierce to very place we have life. This will never happen without a day in and day out journey through His word. Sisters, stay in His word, allow Him to pierce the joint and marrow. It is worth it - that is where He will do His best work. I have to share with you the wonderful news! On Easter weekend I received a locket from my son Stephen and his wife Carrie. I opened it and inside was a beautiful ultrasound picture of my new grand baby - Our first! During my illness with cancer there were more times that I was told I was not going to make it than I care to remember. During one of those times I shared with Carrie how I wished God would allow me to see at least one of my grandchildren. When they gave me the locket, on the back was engraved, I Samuel 1:27 "I prayed for this child, and the LORD has granted me what I asked of him." When it dawned on me what I was seeing I looked at Carrie and she said, "God heard your request." Of course what followed was lots of screaming, laughing, crying, hugging and the family 'dance of joy'!! Yesterday I met Carrie at the doctors office and saw my grandchild growing, moving and I am pretty sure waving at me! What a joy, a miracle, a gift! This has been a great time of celebration for us, but it has been a reminder as well. Our God is the Creator. He is in control. As I looked at those fingers, toes, arms, legs and even listened to that heart beating, I could hear my God saying, "Be still and know I am God." Take time today to remember your Creator. He loves you and wants to take care of everything you are facing today! I noticed one of my sisters blogged about the difficulty of getting up on some Sunday mornings. Boy could I relate to that! In fact, one of the seminars I led at the minister's wives conference in Nashville was "Making Sunday The Best Day." I actually chose this topic because it was something Doug and I discussed and worked on throughout our marriage. I think we sometimes believe it is our day, or our husband's 'big day'. We all know it is the Lord's Day, but how do we actually practice that with all that our Sunday's hold? I wish I could tell you we found the solution and solved this problem completely. The truth is, we did work at making Sunday the best day for our family, but it was a continual struggle. As we addressed this problem in our family, we did find some things that made it a special day for our entire family. Let me share a few ideas with you. Organize! Don't you just hate that word? Organization is not my best thing, yet I found that if I prepared in advance for Sunday, it made it easier to worship and enjoy. I began on Monday preparing for the next Sunday. I planned what my children were going to wear (had a back up outfit ready) and made sure they were cleaned, pressed and ready to go. Doug also included the boys in his personal preparation. He would share with them the topic of the sermon and ask for their opinions. They loved being included and felt they were helping him. It also caused them to be better listeners on Sunday, knowing they would be asked for suggestions. These are just a few things we did to prepare for Sunday. I would love to hear your ideas. We so wanted our boys to love the Lord's day, even though it was often work for us. Today think about what you need to do to get ready for next Sunday. Begin to look forward to worshiping our Lord with your family and your church.